Almudena Bernabeu of 9 Bedford Row International gets a special mention for her work in bring accountability to the family of Victor Jara during General Augusto Pinochet’s rule. Published in the Guardian by Jonathan Franklin in Santiago and Jonathan Watts Latin America correspondent on 23 July 2015. Forty-two years after the Chilean military murdered the poet and musician Víctor Jara, ten of the alleged perpetrators have finally been called to face justice after a judge announced charges against a group of former officers. Four of the suspects immediately handed themselves in and other arrests were expected to follow. 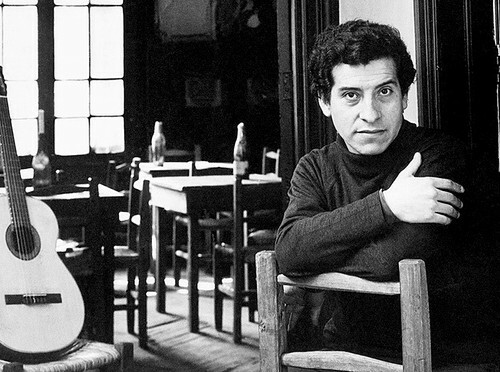 Jara – who was also a folk singer, theatre director and communist party meJuly omber – was taken prisoner during the coup by General Augusto Pinochet in September 1973. Military officers tortured him, broke his wrists and hands, played Russian roulette with him and then on 16 September executed him with 44 bullets. He remains arguably the best-known victim of the coup, but there are many other outstanding cases. According to Chile’s truth and justice commission, 3,095 people were killed during the 1973-90 Pinochet dictatorship, including about 1,000 who “disappeared”. Bodies are still being found today. Judge Miguel Vázquez Plaza also indicted several of the officers in the kidnapping and murder of former prison director Littre Quiroga Carvajal. Like Jara, he was held prisoner at the national stadium in Santiago, then singled out and taken into the dressing rooms where he was tortured and executed. This step in the legal process is more advanced than a simple charge. The next stage will be a trial on charges arising from both cases, which will probably take place around the end of this year or early next year. Jara’s widow, Joan Turner Jara, originally from Britain, called the charges “a message of hope” but said much work still needed to be done to secure justice for her husband and other victims of the Pinochet dictatorship. “If Víctor’s case serves as an example, we’re pushing forward in demanding justice for Víctor with the hope that justice will follow for everyone,” she told reporters. Others involved in the long struggle to hold the military accountable said the judge’s announcement was an important step forward. “These are important advances that are also healing in terms of the psychological and moral [wellbeing] of family members. But it is also healing for society. We want a society built upon truth and justice,” said Alicia Lira, president of AFEP, a support group for relatives of political prisoners executed during the dictatorship. Human Rights lawyer Nelson Caucoto said the courts were moving closer to a judgment in the Jara case, and pointed to progress recently made in another emblematic human rights case, that of activists Rodrigo Rojas and Carmen Gloria Quintana, who were burned alive by military officers in 1986. Earlier this week, a judge ordered the arrest of seven army officers for their role in the attack in which Rojas and Quintana were drenched in petrol, set alight and then left for dead. Rojas died from his injuries, and Quintana was severely injured. The Chilean courts are not the only setting for the long struggle for accountability. In 2013, Joan Jara and her daughters Amanda and Manuela filed a civil lawsuit in the US for torture and extrajudicial killing against former lieutenant Pedro Barrientos Nuñez, who fled Chile in 1989. Barrientos, who has US citizenship through marriage, is alleged to have played Russian roulette with Jara before ordering his troups to open fire. Attempts to extradite him to Santiago have so far proved unsuccessful, but the Jara family’s lawyers are hopeful about the prospects of taking him to court in the US. “We are gearing up for a trial. I am gathering evidence and interviewing [former] members of the Chilean military,” said Almudena Bernabéu, a human rights attorney with San Francisco-based Center for Justice and Accountability (CJA). “Barrientos denies he was physically at the stadium [where Jara was shot] but the conscripts say he was there and was in the room when Jara was shot,” said Bernabéu who filed a civil lawsuit on behalf of Jara’s wife Joan and the folk singer’s two daughters, Amanda and Manuela. Barrientos was not included in the latest list of indictments in Chile because prosecutors wanted to prevent the case being held up by his attempts to resist extradition from the US. He may be added to the case later if he is eventually returned to his homeland.